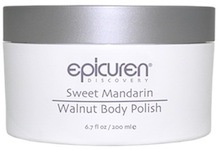 A body scrub formulated with mandarin orange to soothe and exfoliate. Has a lovely fresh orange scent. Ingredients: Purified Water, Finely Crushed Apricot and Walnut Shell Meal, Almond Meal, Oatmeal, Glyceryl Stearate, Cocoamide, Natural Apricot Oil, Orange Peel Extract, Natural Orange Oil, Lecithin, Citrus Bioflavonoids, Natural Organic Surfactants from Soy, Natural Jojoba Oil, Sunflower Seed Oil, Cinnamon Extract, Bearberry Extract, Rosemary Extract, Panthenol (Vitamin B-5), Tocopherol Acetate (Vitamin E), Hydrolyzed Wheat Protein, Cucumber Extract, Willowbark Extract, Grapefruit Seed Extract.